With the ready availability of cheap mass-produced goods and the disappearing of repair skills in the typical household, most of us are used to just throwing away our broken or worn-out belongings. Unless we’re wearing a super-fancy pair, shoes are no exception – how many of us would even think of repairing a hole in a pair of sneakers? 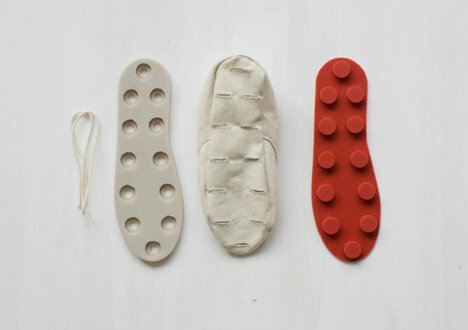 Eugenia Morpurgo has developed a modular shoe kit that is meant to gently shift our attitudes. The Repair it Yourself kit comes with a pair of canvas uppers and a removable set of soles. In most modern shoes, these elements can’t be separated and then rejoined without destroying one or the other. But Morpurgo’s kit was designed to be ultimately fixable. When a hole appears in the upper, there is a tool kit ready to mend it. The wearer can choose how to repair the hole: a darning kit allows for thread repairs, a felting kit provides the material for making new wool fabric, and a patch kit lets the user iron on a fabric patch. Whenever a toe begins to peek through, a quick repair job adds a new bit of personality to the shoes while fixing up the rift. A clever two-piece assembly makes the sole of the shoe both sturdy and able to be disassembled easily. There are no repair materials in the kit for the sole, so perhaps by the time the bottom of the shoe wears out it truly is time to get a new pair.